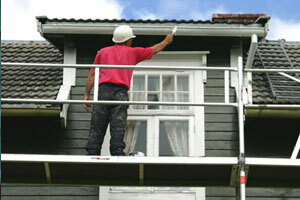 The great exterior painting services of Real Painters will make your home look like a new one. Thanks to our highly advanced techniques and efficient products, we will effortlessly transform your property into well-maintained and good-looking. Our fully skilled professionals are able to improve the look of different outside walls - from brick and masonry to any other external plasterwork or siding. The specialist will help you make the best choice for the needs of your unique property. We have paints for all almost all kinds of exterior surfaces and possess the necessary specialized equipment to complete your job in a smooth, safe and efficient manner. Additionally, the painters we provide are responsive, hard-working and courteous. They will perform the service you require to the highest possible standards by taking into account your personal requirements. No matter whether you need to paint the exterior walls of your house, garden furniture, deck, drainpipes or any other area, Real Painters in Poplar will be happy to do it for you with utmost care and meticulous attention to detail. Our professional painters will give your exterior surfaces a completely new look and add value to your property. Forget about climbing ladders and cleaning up brushes! Book our exterior painting services in Poplar and make this job an easy and simple experience. Our great staff is able to visit you from Monday to Friday (from 8 am to 7 pm). They will suggest the best painting solution for your unique property and give you a fair quote for the required job and materials.